A career of care for thousands of smiles. Just voted a "Top Dentist" by SeattleMet Magazine, Dr. Peter Chiu was educated in California, but he’s a deep-down Pacific Northwest diehard and second-generation family dentist. 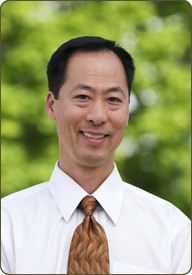 Dr. Chiu earned his BS in Biological Sciences from the University of California at Irvine, and just five years later, received his DDS (Doctor of Dental Surgery) from the University of California at San Francisco. He has also completed advanced studies in occlusion, esthetic restorative techniques and dental sleep medicine.